Burning fat. Phenyl nandrolone propionate stimulates the body to use fat reserves as an energy source. Phenylpropionate nandrolone is its structural modification. A new substance is formed by adding phenylpropionate to nandrolone through a 17-beta hydroxyl group. After entering the bloodstream, the ether detaches and nandrolone remains free. Nandrolone Phenylpropionate is designed in such a way that the peak saturation of the body with the active substance occurs a day or two after the injection. There is ample controversy about how to take Nandrorapid. They mainly relate to the frequency of injections. For men, recommended dosages range from 100 to 200 milligrams every other day. The course of nandrolone phenylpropionate lasts from 6 to 8 weeks (this is quite enough even for advanced athletes in order to build muscle mass). Tightening is not recommended: side effects may occur. Do not forget that phenylpropionate is placed much more often than decanoate. Nandrorapid in gentle amounts can even be applied by women. 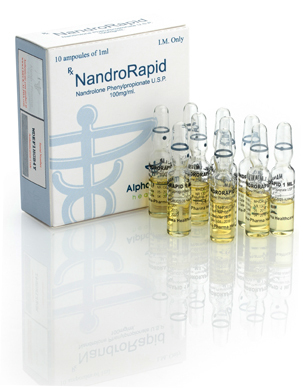 The maximum recommended single dose of an injection of Nandrorapid is 100 milligrams with a “rest” of three days. Phenylpropionate is better than decanoate because, due to the short duration of its withdrawal from the body, the first signs of virilization can be tracked in time and the administration can be stopped. The most frequent side effects of nandrolone phenylpropionate are gynecomastia, an increase in body fat and excessive fluid retention in the body. With long-term use of Nandrolone Phenylpropionate and large dosages, it is recommended to include anti-estrogens (for example, Tamoximed or Clomed) in the course: this will minimize the risk of side effects. As for androgenic “side effects”, they are quite rare (androgenic steroid activity is only 30% of testosterone). If the dosage is significantly exceeded, alopecia may develop or, on the contrary, hair growth on the face and body may increase, acne may develop and the sebaceous glands may become more active.